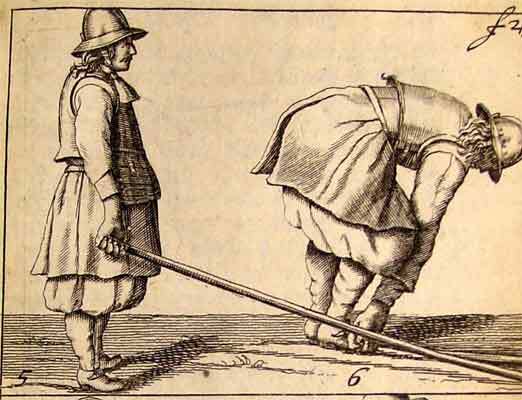 Chapter III: On the use of pikes. How to drag the pike with the tip behind. 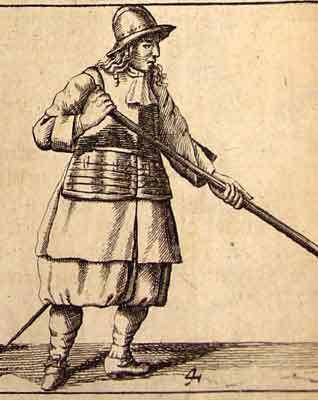 We consider the weapon handling of the musketeers sufficiently handled in the previous chapter, so we now intend to say a bit about the handling of the pike, because an exceptional band is as rare as an army without pikes, whose service is most felt during sudden attack. 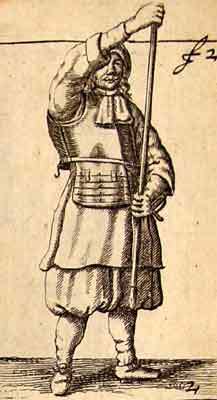 The first picture shows a neat square posture of a pike man, setting the pike against the inside of the right foot, holding the right hand next to the eye, but the thumb up against the pike, as in the picture. 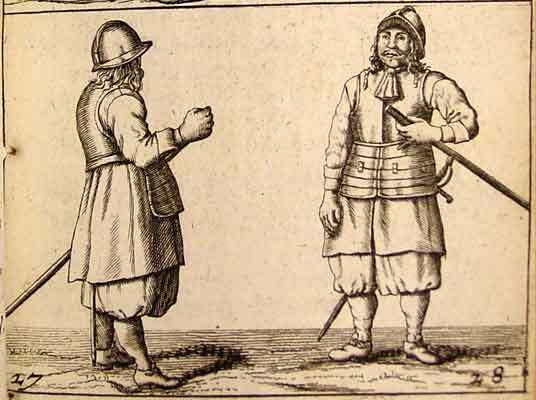 So now, at command, the pike must be raised, turn then with the right hand, without changing grip, the pike before the body, bringing the pike while turning with the right hand as high as possible, which further at half-body is supported by the left, and then again with the right at the lower and held on two fingers, turning the second picture into the third. 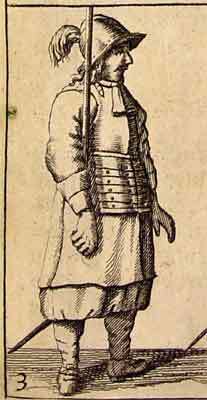 Without taking up the pikes, ranks and files can never be doubled, nor the pikes laid down on order, as also in turning, it's also used when only part of the company or band is in arms. 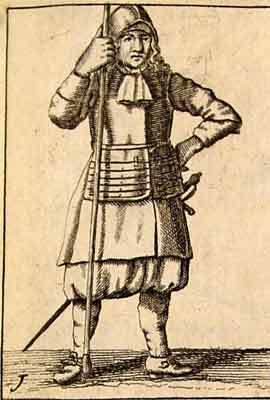 2 The pikes are never laid down but on two occasions, for when the band is ordered to take position behind low cover or breastwork, so as not to be noticed by the enemy; also when the ground is unsuited for planting the pike. To put it down promptly, one shall, on command, grip it with the left hand close to the eye, and, turning the tip towards the ground next to the right side of the man in front, advance the left foot, but the right hand shall hold the lower end in reverse grip, as can be seen in the 4th picture; when the hand, being turned towards the body, in the drawing back of the left foot, we get the 5th picture; to easily put the pike on the ground next to the right foot, as the 6th picture shows. 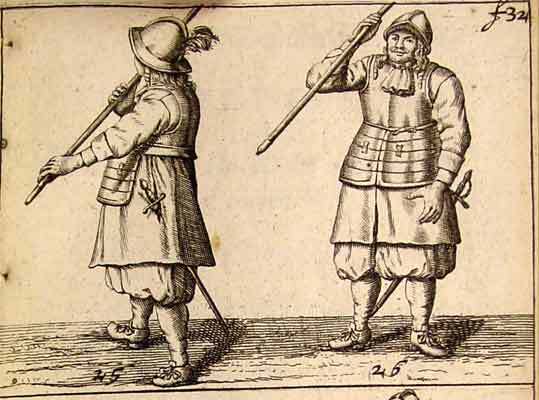 When the command to raise the pike again is given, all face the front again as in the 7th picture, and by gripping it again as before, come back to the 5th picture. When then the body is turned by advancing the left foot, bringing by the same twist, with the left hand, the pike to the 8th picture. Drawing back the left foot returns us to the 3rd picture. 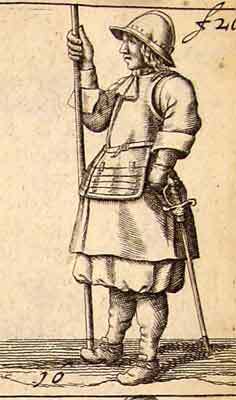 The pike is again set down, gripping with the left hand next to the head, and so lowering the pike, the right hand - while the left is at half-body - is brought as high as possible on the pike, and when the pike is put down, it comes next to the eye, making the 9th picture into the 10th. 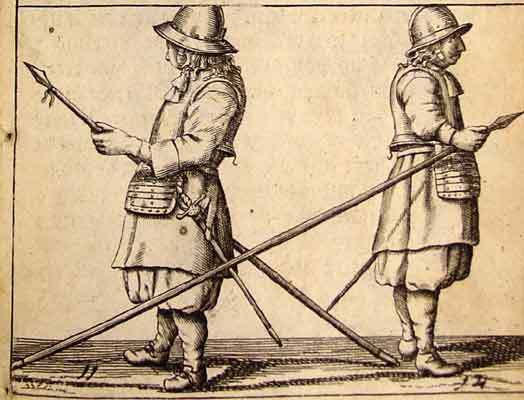 3 When needed, pikes are dragged by the point, as in the trenches, so that the enemy can't see the movement. 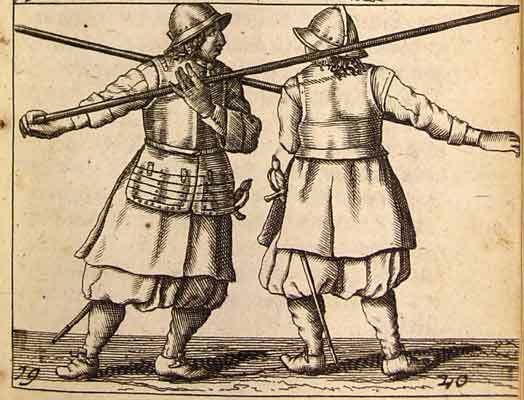 Some want to have the pikes carried level on such occasions, but this is inefficient to go against the enemy, the ranks can't remain closed, and the man behind is in danger of hurt by the tip, and the pike can hardly be couched from this, because the enemy is only expected from the front. In the army of the United States [the Netherlands] I never saw it in use, but the Imperial and the Spanish do. 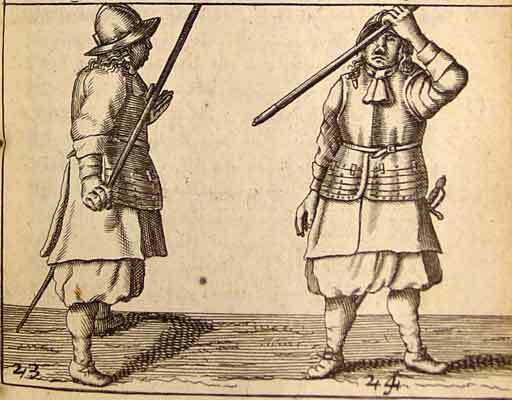 A pike man shall, at the command, "the pike, to drag", stepping back with the right foot, bring the pike back on the right of the man behind him, as shown in picture 11, followed by 12, that holds the pike by the tip in the right hand, resting on the side of the weapon [? ], and not let it hang, so that when it needs be couched, it will be above the man in front; or when the enemy is imminent, the command to take the pike by the point follows, which then, by bringing the right hand forward, and placing the left behind it, again followed by the right, as picture 13 shows, above the man is. The pike is then couched by placing the right hand as high as it will go, while stepping back with the right foot, and the left hand grasps the pike so low, that the right can reach the lower end, as in picture 14, on which should be noted, that the elbow of the left arm is closed against the body, to place the pike in the hand, not on the hand along the arm, because by so bringing the arm away from the body, the strength is not as great, as the hold where the arms are closed against the body. Like this, being the couching in front, shows. 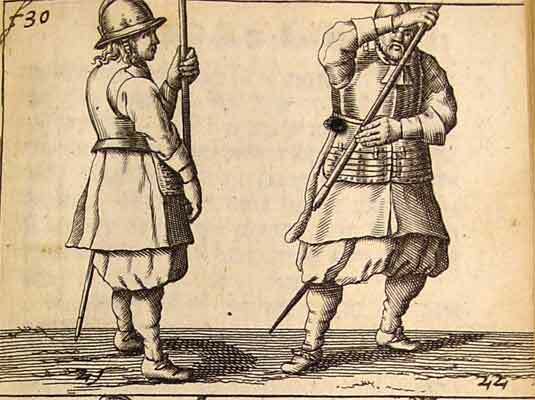 When it is ordered to carry the pike slanted, then the pike is raised, while straightening the left leg, without changing grip of the hands until it is raised, as in picture 15. 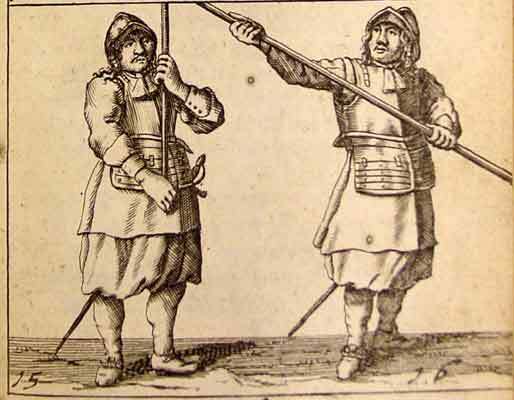 In picture 16, the right hand is, from below brought along the pike as high as one can reach, watching the tip so it doesn't sway, the pike is brought to the shoulder while advancing the right foot. 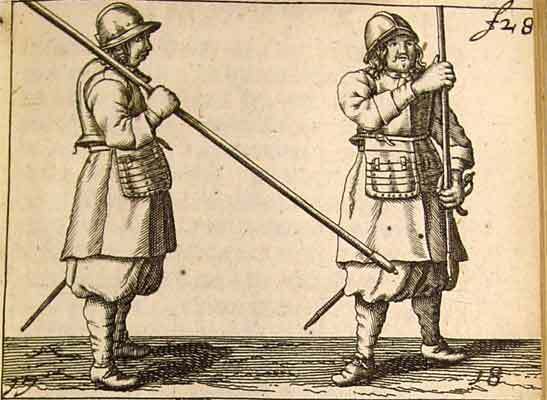 4 Before discussing the command to couch the pikes, restoring the pike to the slanted position must be mentioned. 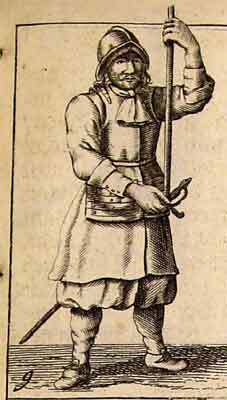 The pike, being on the shoulder, with the thumb below, and the arm a little from the body, to march: as in picture 17. 5 Couching the pike is wonderful exercise, as it can from all sides promptly, and being couched in good order, brought back on the shoulder. At the command to couch to the right, take the left hand halfway between the right and the lower end of the pike, which, stepping back with the right foot, is raised in front of the body, as in picture 18: the pike is held thus until the right foot is brought back again, to let the pike fall to that side, where before the right foot was, as in picture 19. In this falling, the right hand is placed on the lower end of the pike, as shown on picture 14: to replace it to the slanted carry, it must again be brought straight up, as in picture 15, and be held with both hands, without changing grip, replacing the right foot, letting go the right hand, that grabs the falling pike as in picture 16, which restores picture 17. When it is sounded to couch the pike to the left, again step back with the right foot as above, but in bringing the pike in front of the body, bring the right foot back to its place, turning the left foot without moving the heel, with a bent left knee, as in picture 20: bring the pike to the shoulder as in picture 21, holding it straight up in front of the body, without re-gripping the pike, the left foot back, the right hand up under the pike, as in picture 16, and to the shoulder, as in picture 17. The pike can also be couched to the rear to good effect, in different ways, for which we will show the most important. Couch to the rear by bringing the right hand above the head, where it is joined by the left hand, while the right grabs the lower end, while advancing the right foot, as is shown in picture 22, thus coming into picture 23. 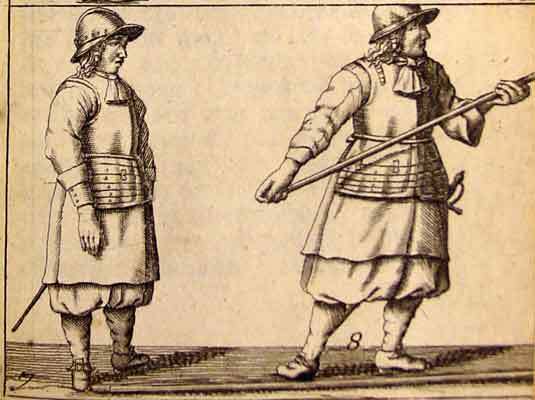 On the order to carry the pike slanted, bring it with the left hand over the head, while stepping back with the right foot, as in picture 24, and further, as in picture 16 and 17, back to the shoulder. The same can be done in this manner, which I consider better, because it can be done more securely with less worry about crossing of the pikes; placing the right foot back, without changing grip of the right hand, the left gripping the lower end of the pike, as in picture 25, to raise it as in picture 18, making it at once picture 23, also further couching the pike: when they shall again be carried slanted, bring the pike straight up without changing grip, bringing the right foot wholly back to the previous position, so as to bring it to the shoulder as shown in picture 16 and 17. 6 Still we shall say something of dragging the pike with the tip backwards, which occurs most often for retreating from trenches, where the advantage is in retreat. 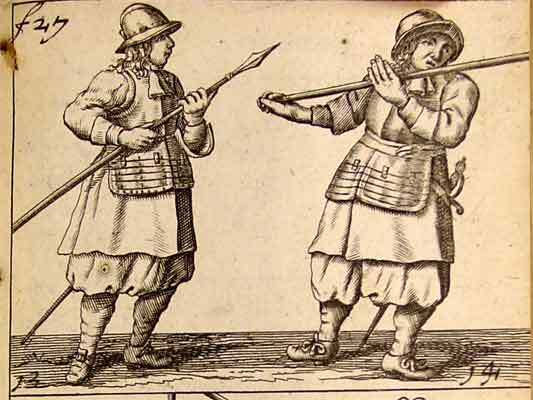 The necessity of this is self-evident, as we show that the misuses depicted in picture 11, of carrying the pike any other way as dragging, have already been explained; as having the point before you on entering the trenches, because the enemy is expected from this side, and the pike can not be used in any other way, so the same applies to dragging the pike with the point to the rear; The pike being raised over the head with the right hand, as picture 26 shows, the right foot advanced, and with the left hand grabbed close to the right, which is then placed on the lower end, at which the pike is lowered on the left side of the man behind him, taking care that the tip does not hurt anyone, as is shown by picture 27, which, marching, becomes picture 28: So when the besieged make a sortie, we can turn and defend with couched pikes. More handling of the pikes could be mentioned here, whose purpose is more for show than necessity, so, skipping what is unnecessary, this may be enough.